Another day in paradise. Patricia worked from home while I drove in. The roads were greasy, so much so that the anti lock brakes kicked in a few times on the way to work. Work was fun as always. All too soon, and much to my disappointment, the day was over and I reluctantly drove home. Patricia had spent the day in her home office, the small bedroom upstairs that I cleaned out for her use early in January. I had ordered an adapter from Amazon that connected to the mini dvi port on her tablet and whose output was a choice of female vga, hdmi or dvi. I used vga only because I couldn't find the dvi cable and had a few vga cables kicking around. The sole usb port was hooked up to a usb hub, so she can use an external mouse and keyboard. It sort of gives Patricia the equivalent of a docking station, kind of like the one she has at work. The adapter cost me all of $17, and I already had the usb hub, mouse and keyboard. Anyway, she is happy that she can work from home and in a home office with roughly the same computer equipment that she has at work. We had a dinner of left overs. Shortly thereafter, Patricia conked out on the couch while I watched some stuff on Plex. It is another fun, fun fun day in the life of Bevboy. How do I handle all the excitement? On that note, I think I will turn in. I may have to take something to calm myself down, since I had such an exciting day! I wish I could say it was a wonderful day. But it was like most any other. Got up. Found something to wear. For a change, it wasn't any of Patricia's clothing. Heeded the weather forecast, which made things sounds as if it would be the worst day ever for driving, in the history of driving. Patricia stayed home, so I got to work by 7:30. A busy, but mostly uneventful, day at work. Got home before 5 because Patricia had stayed home. She cooked us salmon and brussel sprouts for dinner. After the news was over, we watched "Black KKKlansman". I had not seen a Spike Lee film in quite a few years. I have found him preachy more than entertaining, and I find that kind of pretentious bs to be off putting, and not the type of film I want to watch. But this was mostly a fine film, with more than a bit of humour. It was marred by the last five minutes where for no reason relevant to the storyline, they fast forwarded to 2017 (from the 1970's) and showed some modern day white supremacists, I guess to illustrate that they are still out there, even though we all know that. I recommend this film, but it certainly isn't for everybody. I am still coughing, but nothing like I used to. I only have to take the puffer once or twice a day now. I must be getting better. He said, hopefully. Well, I didn't mean not to write for five days. Just turned out that way. I have been going to bed early most nights, although Friday night I was in the Valley, returning Saturday morning. Which was my birthday. Yes. Wish me a happy belated birthday. I am... 55 years old. My goodness. I cannot believe I just wrote that. I am but five years away from being sixty, which scares me even more. Patricia and I had a roast beef dinner on my birthday, courtesy of a local church. The beef was overcooked and chewy in a way that made me wonder if it was worth all the effort to eat. Spoiler alert: It wasn't. We mostly stayed in on Sunday, but ventured out this afternoon to get some food. Also checked out the pet store in Tantallon at the Hubley Centre on the off chance that they might sell the litter that Newbie likes so much. Against all odds, they do! And they had quite a few bags of the stuff. From there we went to Otis & Clementines where Patricia bought me a copy of the book "Black KKKlansman". We made our way over to Superstore before having dinner at the Wing'N It, also in Tantallon. I had the fish and chips, which were good. Patricia had boneless wings with sweet potato fries. We started off with a pretty good Caesar salad. We had a dessert of fried bread dipped in syrup or something. A Newfoundland delicacy that Patricia knew the name of but I didn't. We returned home. Newbie loved me for the new cat litter, which I also have to install downstairs. By "happy" I mean that he has looked at me with about 3% less disdain than he normally has for me. Another three day weekend is behind me. Reality hits in just a few hours when I have to get up and return to work. Where do these weekends go, anyway? Let's try something a little different this evening. I am researching a few cases for my Frank series. Perhaps you can help me. Arlene McLean disappeared from her home in Eastern Passage on September 8, 1999. She went out in the car, and hasn't been seen since. Her car has not been seen since, either. Crystal Dawn Jack went missing in 1997, although it took anyone a week before they noticed she was gone. In 2002, some surveyors in Lower Sackville found a skull bone, later identified as being Crystal's. The rest of her has never been found. Probably an animal dropped it where it was found. And Nathan Cross was murdered in North Preston in 2011. His mother was Laura Lee Cross, who was herself murdered. If you know anything about these cases, please let me know. I guarantee anonymity if you request it. Your best bet is to email me here. While we are at it, if you know anything about any unsolved crime, such as an arson, or major robbery, or an unexplained death, let me know about that as well. I am trying to expand the scope of my series in Frank to include these and similar things. Wish I could say I did all kinds of things today. But other than some laundry, we didn't do much. We did work our way through the first eight episodes (of ten) of "The Umbrella Academy" on Netflix. It is excellent. We hope to finish watching the series Tuesday evening. Another weekend is behind us. It is back to reality in the morning. The good news, though, is that I have this coming Friday off, so this is just a three day work week. A Bevboy can get used to this kind of thing. Oh, before I forget: I will not have an article in the issue of Frank that hits stores this week. Hoping to have one in two weeks. Nothing to do with my editor. Blame me. Lots of sleep the last couple of days. Perhaps too much. It is now nearly 12:30AM on Monday morning. I am off work on Monday, so I can afford to have a late night. I imagine I will be awake for another couple of hours. That's fine by me. We have had a quiet couple of days. Saturday I only went as far as the post office to pick up a parcel and then in the afternoon to cash in the cans that had accumulated in the last couple of months. The parcel contained magazines I bought off an American acquaintance. 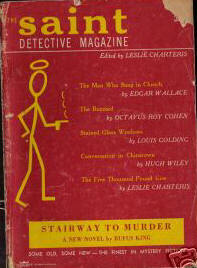 They are vintage back issues of The Saint Detective Magazine. The Saint, if you don't know or recall, was Simon Templar, a vintage Robin Hood-like criminal who also looks after himself financially. The original stories by Leslie Charteris ran from the 1930's through the 1960's. 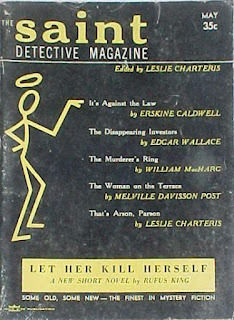 The magazine appeared in the early 1950's and ran for 13 years or so. I now have some issues from that run, where until yesterday, I didn't have any at all. If you know the character at all, and are of a certain age, you may recall the Roger Moore tv series, or the much later one starring Ian Ogilvy. Or maybe you remember the 1997 Val Kilmer abomination of the Saint. Or maybe you have heard an episode or three of the Saint radio show, starring Vincent Price. 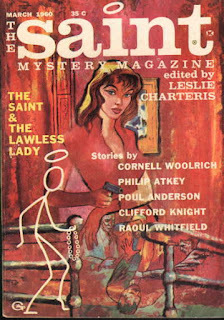 Anyway, each issue contains one, sometimes two, Saint stories. Some of these tales were reprints, and some were new. Other stories were by the writers of the day like Donald E. Westlake, Lawrence Treat, Cornell Woorich, Edward D. Hoch, and so many others. Here are a few sample covers, to show you what fun awaits me. Bet you can hardly contain yourselves, wot? Get your own! 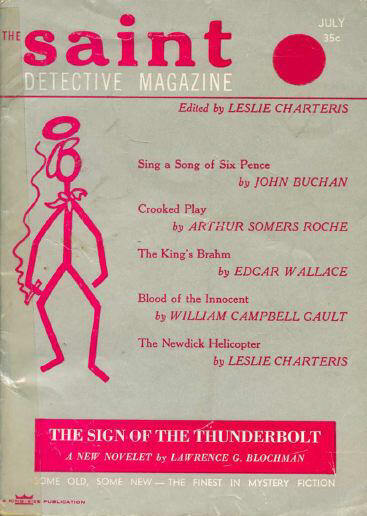 There were an awful lot of crime fiction magazines back in the day. The Saint. Manhunt. AHMM, EQMM. Charlie Chan had a mystery magazine for a short while. Mike Shayne's Mystery Magazine was a mag that paid very poorly but didn't care much what writers produced, so long as it featured some crimes and preferably some private investigators. I have about three dozen issues of "MSMM", about 10% of all of them. Several writers popular today got their start there. 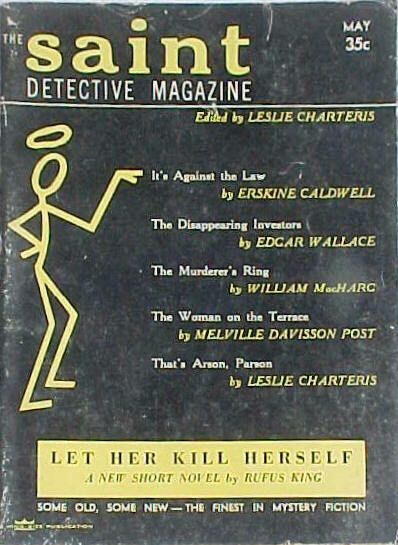 Even if you discount the pulp magazines of the 1920's-40's, there were plenty of other crime fiction magazines, a couple of which continue to be published. 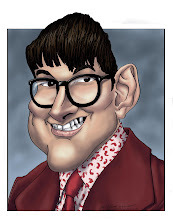 Heck, if you want a Nova Scotia connection, ex Chronicle Herald hack Dean Jobb now writes an online column for Ellery Queen's Mystery Magazine. Here is a link to these articles. You can follow the link to read all of them if you wish. My interest in crime fiction goes back to when I was 11 and a young man up the hill from us was selling magazine subscriptions from his school. Dad agreed to buy me and my sister a magazine "as long as we read it", as he stated, as money was scarce and he didn't want to see it be wasted. I looked through the catalog listing the offerings and saw something called Ellery Queen's Mystery Magazine. The Ellery Queen tv show was on the air that year (starring Jim Hutton and David Wayne) and I loved the show and thought I'd try the magazine. EQMM got me through some hard times. After the subscription ran out, I could only afford to purchase the magazine at stores from time to time, but by the end of my high school days I had made it a priority to read the magazine on a regular basis again. Sister magazine Alfred Hitchcock never interested me as much, but i have grown to appreciate its charms and strengths over the years and have a few hundred back issues of it. But I have issues of EQMM going back to the mid 1940's, and have long, seldom-interrupted runs of the magazine starting in the mid 1960's through to the issue that came out last week. I am not sure where I am going with this. I have written about my affection for crime fiction over the years as evidenced by the "ElleryQueen" and "EQMM" labels the blog has. I have told you about this stuff before. But it bears some repetition to tell you about the things that interest me, to let you know that those things still interest me. Just this evening I was sifting through some of the old Alfred Hitchcock anthologies in search of stories written by Jack Ritchie, one of the best short story writers of the 20th century, in my estimation. What that man could produce in, say, 2000 words would take a less skilled writer 10 000 words to do half as well. There are so many other examples of short story writers who can tell a complete story better than some novelist who doesn't know when to stop. I think I may read a short story before I turn in. So, pleasant dreams, my friends. I am still coughing, but not nearly as much as I have been. I took the puffer once, this morning. Haven't had a coughing jag in a few days. Is this bloody cold/virus/cough/whatever, finally in my rear view mirror? This particular "whatever" has been very persistent. I have paid my dues. I have tried the patience of everyone around me, with my coughing, for far too long. After work tonight we went to Halifax Shopping Centre. I wanted a new money clip as I have long since misplaced the last one I had. The "Things Engraved" store had several varieties in stock. I selected one. Patricia took it from me as she wants to buy it for me for my upcoming birthday. It was on clearance, but when it rang through it was less than half the price it was on the box! The lettering we had added cost nearly as much as the clip itself. It says "BDK", on the front. My initials. And "Bevboy" on the back, for obvious reasons. We had to wait for the work to be done, so we drove to the Kempt Road Swiss Chalet for a Valentine's Day dinner. I ate too much. We like Swiss Chalet a little too much. Other than my birthday next week, we have promised not to eat out going forward. We have too much food on hand. We are foodies, but we can be foodies at home, with victuals prepared in the Instant Pot or on the stove. I have been on a course at work the last few days. Wednesday night we did not finish until after six pm. I was fried. We drove home and I turned in early. We finished at 5:30 tonight, which made me happy. You have a good evening, my lovelies. See you tomorrow. Yeah. Pretty much sums it up. I took my puffer this morning, which controlled my coughing for most of the day. But after work, sitting in the car, waiting for Patricia to show up on the bus, I began a coughing jag as violent as any I have experienced since I got sick over the holidays. I nearly vomited. I took my puffer again, and things returned to normal. Six hours later, the coughing is starting up again. Wonderful. Just wonderful. We got home and I cut up veggies for our roast beef dinner. It was a blade roast, not my favourite cut at the best of times. Patricia threw everything into the Instant Pot I bought for us for Christmas. The amount of fat on this normally-fatty piece of meat was nearly off the charts. Even eating the small piece Patricia hacked off for me was a chore, and I very much like roast beef. We hate to waste food. But we don't want to eat the rest of it, and I'm not sure that this is really food. The thing is, there is another blade roast in the freezer. We don't really want to cook the thing, for fear it is along the same lines as this one. Tomorrow I will be having lunch with a friend. Looking forward to it. I promise not to order roast beef! Six days later. Still alive and functioning, more or less. But it's still mostly me going to work and resting as much as possible in the evenings. Went to the Valley on Friday morning to deal with some stuff. Very pleased with how it turned out. I returned to the city during the lunch hour. Newbie and Patricia greeted me with a similar amount of enthusiasm. I tried to take a nap and didn't quite succeed. Took a long shower and watched some telly. I am still feeling off, even though my doctor put me on a puffer the other day. It is treating the symptoms quite well but has a few side effects I'd rather not get into. I am calling this short, as I need to rest because I will have a busy day on Sunday. Not watching "the big game".